As has been widely reported elsewhere, the neighborhood group known as We Are Aptos has filed suit against the Santa Cruz County Board of Supervisors and the various developers of the new Aptos Village. The group’s web site provides some information on the lawsuit, in particular a letter sent to the Board of Supervisors by local land use attorney Bill Parkin of Wittwer Parkin. One item absent from the group’s web site is an actual copy of the complaint, that is, the text of the lawsuit which has been filed. As this is public record, it has been obtained from the Superior Court of Santa Cruz County clerk and is being made available here for the public’s examination. The crux of the lawsuit seems to be that the Final Map approved by the County Board of Supervisors in December 2015 differs “substantially” from the Tentative Map approved in 2012, and that this is a violation of the California Subdivision Map Act (and Santa Cruz County Code section 14.01.209(2) as well). The suit alleges that not only are the tentative map and final map substantially different, the final map leaves off entirely a new county park, which was to be donated by the developer and for which the developer apparently received a handsome reduction in fees. a portion of a unit or units of improved or unimproved land which a subdivider has designated as not being divided for the purpose of sale, lease or financing. The question naturally arises: why are there now several remainder parcels on the final map, instead of what was shown and approved on the tentative map? Not surprisingly, it appears to come down to money. The final map which was approved is only for Phase 1 of the project. The rest of the map will be filled in subsequent phases. Developers use this approach to delay paying substantial development fees. Likewise, the “park” – a rugged piece of terrain which though considered a “Common Area” will likely exist primarily as open space or wildlife habitat – should show up on a subsequent map. –Mary Gourlay, Barry Swenson Building Development Project Manager. We are disappointed this suit was filed. 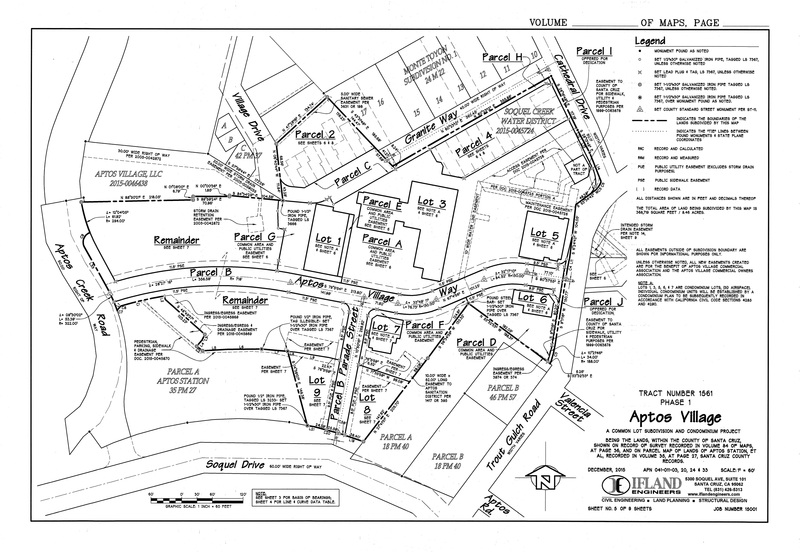 The Aptos Village Plan dates to the 1970s and is the result of years of community meetings. There is widespread community consensus on the need for new housing, including affordable housing, and this project begins to address those needs. Aside from the phasing of the project, there are some differences between the tentative and final maps. For example, the tentative map shows “Valencia Street” leading straight out of the village to Trout Gulch Road, whereas the final Phase 1 map shows the street as a renamed “Aptos Village Way” curving before it reaches Trout Gulch. It’s an open question if a judge would consider these variances to be a “substantial” difference or not. For the time being though, it looks like work is proceeding apace on the Aptos Village project, and both the developer and the Board of Supervisors seem confident this lawsuit will have little or no impact on the development plans and schedule.